In the next video, the speaker analyses factors affecting radar range If you work in radar, you need to memorize these relationships. But wait, there are exceptions to the radar range equation! One factor that is not covered in the "simple" radar range equation is atmospheric attenuation. Learn about that on this page. Later, we'll add this factor to the equations. 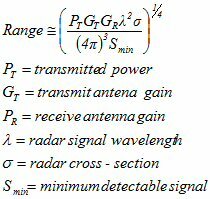 The radar range equation can take many forms, in terms of energy, antenna diameter, receive noise figure, etc. And the "range" will be different in a bi-static radar. From the equation it is easy to see that in order to double range, you must increase power by 16 times (12 dB!) if everything else is kept constant. Or you could quadruple the frequency (one fourth the wavelength), or double the radius of the aperture. In radar range, aperture area is the most important thing to consider! Note that if you increase the frequency or antenna area, the change in gain means it takes more beams to search a given volume.